We desperately need to set the “promiscuous mode” and “Forget transmit” to “Accept”, here is thoroughly explained why. 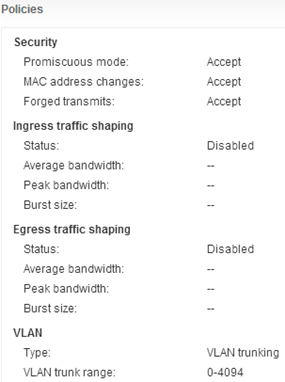 If you want to, and certainly we want to use VLANs inside nested ESXi, is set “VLAN Type” to “VLAN Trunking” (VLAN trunk range is not necessary, it maybe single VLAN) . This and only this setting will work, otherwise the network will not be within our ESXi. At the end I can still only confirm that the nested ESXi 5.1 vSphere prepared easily operate in vSphere 5.5! I have Intel 5160 processor and that does support Intel VT but not Intel EPT. I am getting error that I cannot run 64 bit nested VMs. Can I still do all the lab activities required for VCAP-DCA? Intel EPT is required for runnig nested Esxi. When asked about the VCAP-DCA you need to answer the same, can the theory be enough?